The Tailor’s Table – Revealed! What’s on a tailor’s table?! 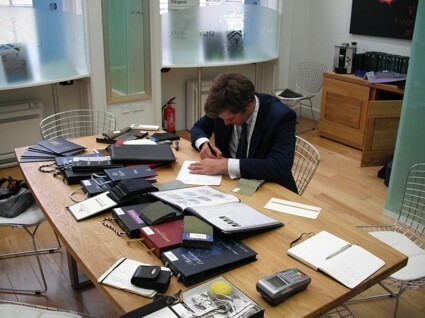 Pictured is Charlie – the creator of Henry Herbert Tailors – at his Savile Row desk. It is not the tidiest desk in the world, but it has all the tools he needs to go through an order with each customer – tape measures, pins, chalk, books (and books) of fabrics and an order form. Henry Herbert is a scootering tailor service, using our fleet of Piaggio scooters to meet customers wherever and whenever is good for them. Or they can meet us, by appointment on Savile Row. To Book a Tailor, just click here. See also: bespoke suit london, Charlie, desk, Henry Herbert, Henry Herbert Tailors, London Tailor, Savile Row, savile row suit, scooter tailor, tailor, tape measures, Visiting Tailor Service. Henry Herbert tailors keep trooping through the snow! The Tailor's Table - Revealed! - Bespoke Suits By Savile Row Tailors.